As a friend of Beverley, she often talked about her research and work. She offered it to me but I believed that it would not work! How could changing pictures in my head change my life, I could not see it happening. She gently steered me toward giving it a go. I was still very skeptical and I can’t believe the difference it has made. Before doing the My Envisioned Mind I was a frightened little girl stuck in the abuse. 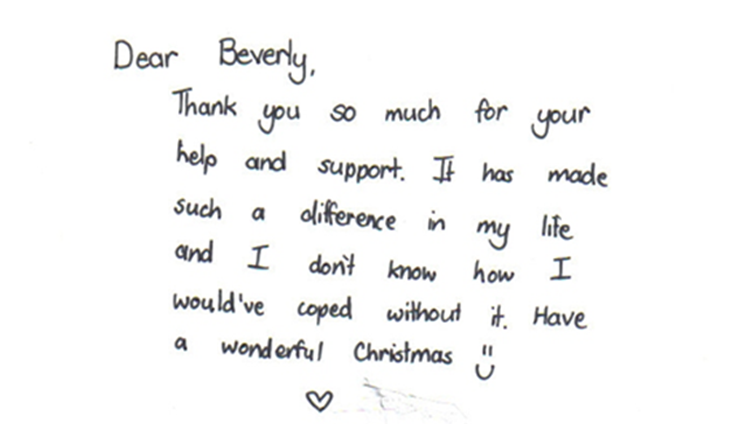 Since 14 years old1 have been self-harming until Beverley changed this. I have been hospitalized more times than I can count over the 23 years I was mentally ill. I have had 7 diagnoses, have been on over 15 types of medication and have seen psychiatrists and psychologists since I was 14. Three years ago 1 was a confused, depressed and anxious woman. Through Beverley’s work 1 have become calmer and am an achiever. I have gone back to school and have successfully completed all subjects I have attempted at year 12 level. I am at the stage of realising my dream; to become a writer. Without the My Envisioned Mind, I would not be where I am today, 1 would still be in the ‘revolving door syndrome1 in the mental health hospital system. One of my proudest moments was to hold a party last year to celebrate my 5 years out of the hospital, which is the longest I have ever been in 26 years. Beverley met with me approximately 3 years ago. Every 2 months we met to work on the 8 steps of the My Envisioned Mind and ‘fine tuning’ this process to my wants and needs and ‘boy did it pay off’. My stress levels dropped and no longer did I spend much of my day reliving my horrible childhood, I was consumed by my memories of my physical tormentors. I was frightened much of the time, which led to a form of paranoia and obsession. This fear in conjunction with my bi-polar stopped me from having a full active life. 1 had done over 10 years of martial arts but still had all the fear. 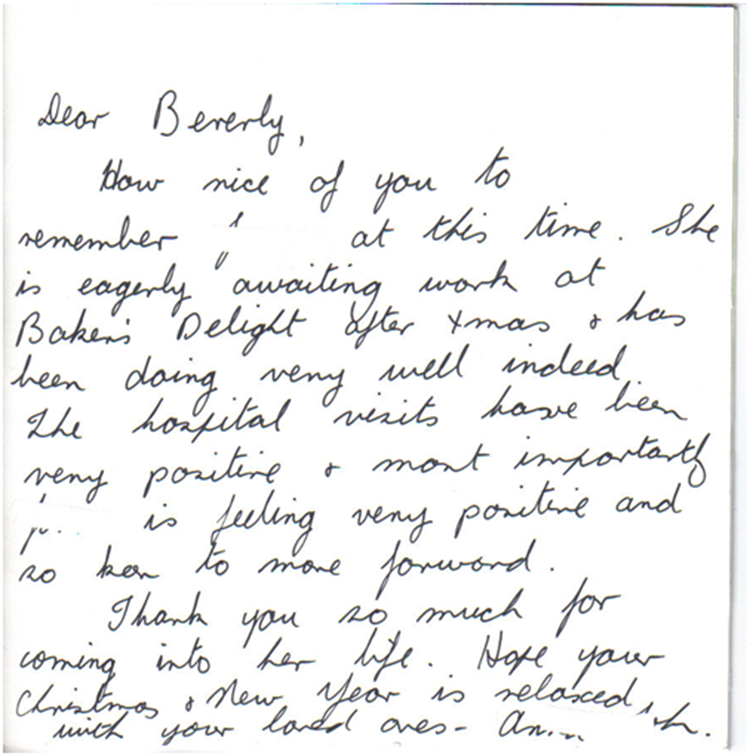 Contrastingly the work I did with Beverley was more efficient in restoring my moods and balance, which has led to a better quality of life. I have been told for years ‘be positive’ ‘cheer up’ ‘you can do better’ but for the first time, I was shown a better and gentler way to achieve this. What the My Envisioned Mind. has done for me is: minimising the negative memories and giving me a positive future. I have now finished training for the open workforce and have held down my first job in 27 years. I can now drive and park in the city without fretting. There have been subtle progress and I can look back over these last 18 months and realize ‘I can do things now which I have been unable to do all my life’. Now I am the bloke I should have been! 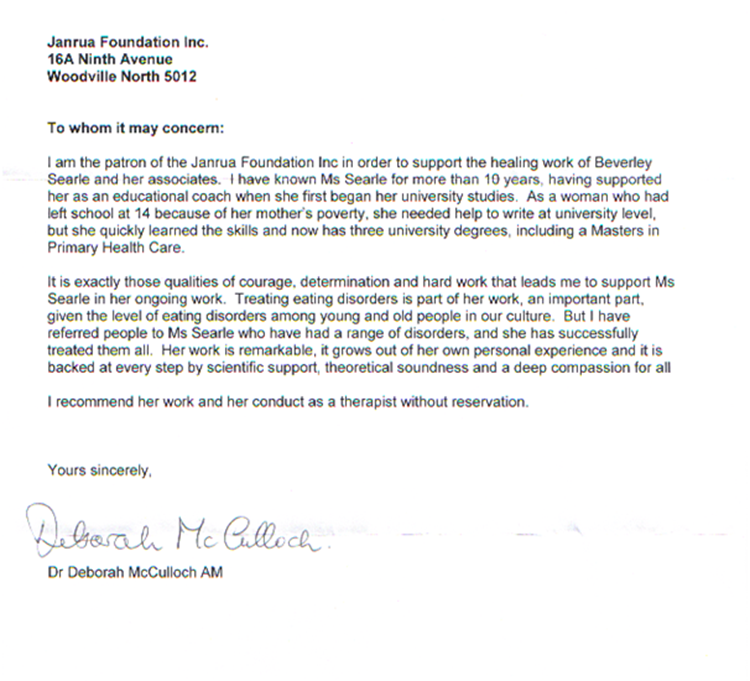 Beverley Searle: The My Envisioned Mind Clinic, 27th May 2008 Dear Beverley I am writing this letter to you to support your nomination for the “Disability of the Year Awards”. As I have known you for a period of 10 years and watched you dedicate your life to the well-being of others even though you have had your own personal struggles with disability and financial security. I strongly feel you deserve this award for the very reason that for the past 20 years you have given of yourself to benefit others and help them achieve wellness. Purely from the giving of your empathy and compassion, through hard work, service, and commitment to your community. You have personally helped me on many occasions when I have struggled with my own journey of mental illness. Your input and support were invaluable for me to be able to keep functioning within my family unit. I have also seen the positive effects you have had on others I personally know and see the effective difference the giving of yourself has had on their lives. This award would be acknowledgment for all the hard work and commitment you have given to your community and the positive effect you have had as a contributing community member who has worked to overcome their own disability to aid and support others. You are one of the most selfless people I have met in my life, a true angel. The acknowledgment this award would bring would be a further benefit to help you continue your work on a wider scale which is so needed!!! I wish you all the luck Beverley for you deserve this award and it is an honor for me to be able to write this letter of support for all the help and support you have given to me over the years.